Leaving your fellow beachgoers behind might take some motivation, but it can offer you a chance to go native. The Tainos settled in the Dominican Republic in the seventh century and developed its original culture; these are the people Christopher Columbus encountered when he arrived in 1492. Their lifestyle was simple enough: They hunted, fished and farmed; they lived in vine huts and slept on hammocks; they carved wood to pay homage to their gods; they passed the time with dance and song. The Taino influence is alive today in the names of many towns and the cuisine, and several museums throughout the Dominican Republic – such as the Museum of Taino Art in Puerto Plata and the Museum of Dominican Man in Santo Domingo – offer a glimpse into this important past. The history of colonial expansion in this part of the Caribbean is not without controversy. But from an experiential aspect, leaving the beach for the city streets of Santo Domingo, this nation's capital, is a step back in time. The sector known as the Colonial City, replete with cobblestone streets, was declared a World Heritage Site in 1990 and is a study in juxtapositions: modern buildings next to 15th century houses and new cars next to horse-drawn carriages. It's considered the oldest city in the New World and boasts its very first street, its first hospital and its first university; the Cathedral de Santa Maria la Menor, the oldest church in the Americas, features a golden façade made of coral limestone. 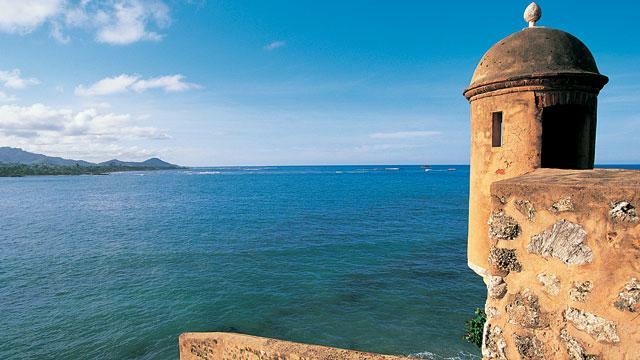 And if you want your Christopher Columbus fix, Santo Domingo is home to the Alcazar de Colon, a palace holding Columbus family artifacts, the Ozama Fort, where he was once imprisoned, and the Faro a Colon lighthouse, which houses the explorer's remains. The Dominican Republic is home to both the highest and lowest elevations in the Caribbean; both can make for fascinating visits, especially for the experienced adventurer. At more than 10,000 feet, the Pico Duarte peak is part of a mountain range that cuts across the Dominican Republic from east to west. Guided tours are most prevalent when the weather is best – January through March – and five trails will get you there; the shortest, La Cienega, runs about 15 miles from the city of Santiago and reaches Duarte's zenith in about two days. If getting low is more your style, consider Lago Enriquillo, the Caribbean's largest lake and lowest elevation. Plan ahead for this trek; located 12 miles from the Haitian border, it's intermittently attended by park personnel. But getting here will reward you with a plethora of reptilian life and a rustic wooden pier that jets more than 60 feet across the lake. Trade the scent of suntan lotion for the waft of native flora. The National Botanical Garden in Santo Domingo takes up just one square mile but is replete with trails that lead you to many of the plants indigenous to the Dominican Republic, such as orchids, palms and aquatic flowers. There's also a lovely Japanese garden. Its lush tropical topography affords the Dominican Republic myriad parks that can range from natural habitats to zoological reserves; many are home to ancient caves. At Caberete, a resort town near Puerto Plata, you can ride a horse through El Choco National Park and then swim inside its many caves. West of La Romana, the Maravillas National Park houses the "Cave of Miracles," which holds old Taino paintings. Nearby, the caves at Fun Fun Cave – the largest in the Caribbean – lure adventurers with their dark corridors and the four-mile underground river that runs through them. And don't miss Los Tres Ojos, near Santo Domingo, named for the three lakes nestled inside three caves; bats and turtles abound, and you'll find a series of stalagmites. Your all-inclusive might tempt you to stay put; there's plenty to fill your plate. But because many resort towns are at the epicenter of the country's burgeoning cuisine scene, that other hotel down the beach might be serving up something worth exploring. Take Punta Cana, where destination eateries include the Blue Marlin inside the Secrets Sanctuary Cap Cana Resort; this eatery exudes South Pacific charm and runs its own fleet of fishing boats to nab the freshest catch of the day. The quiet, upscale Sivory Resort is home to three distinguished eateries; Gourmand Restaurant gets marks for quintessential French fare and an awesome wine list. Captain Cook Restaurant is not in a resort; it's got a prime setting right on the beach. But this casual eatery is worth mentioning for the high marks it gets. It draws diners with a value price point and wows with the Creole-style langostinos. The Saona Peninsula misses out on the crowds that flock, instead, to spots like Punta Cana and La Romana. So this can be a real haven, with its towering mangroves, sandy beaches and intense biodiversity. The Los Haitises National Park is here, with its Taino petroglyphs, lush rain forest and plethora of parrots. The village of Las Terrenas is home to many European descendants, and several quality pastry shops. And the shores of the town of Samana offer prime viewing, especially January through March, when humpback whales come here by the pod-loads to mate. Gabe Saglie is senior editor for Travelzoo, which features hotel, airfare and a bevy of local deals in the Dominican Republic.